A performance round with modern touches in the simple style of the old school cartridge, this Silvertip JHP load from Winchester in .45 Colt is a great shooting round. 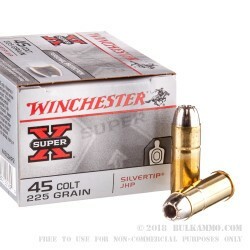 The 225 grain projectile is the well-known Winchester Silvertip that offers great expansion, nice energy delivery and good consistency. The history of the Silvertip line throughout the Winchester timeline has been one full of performance. The general acceptance of the Silvertip by police and mainstream shooters makes this a popular round, even now, at a time when the biggest ammunition industry headlines involve much newer innovations and technologies. That should speak volumes about the staying power and capabilities of the Silvertip line. It should speak volumes about the trust that the shooting public has in the Winchester brand name. 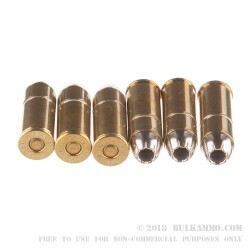 It should speak volumes about how little impact, decades of “innovation” have had on tried and true calibers like the .45 Colt and the Silvertip projectile. That isn’t to say innovation isn’t important or advancements haven’t been made - it is to say: Winchester can almost rest on its laurels given the fantastic product they put out way back when. 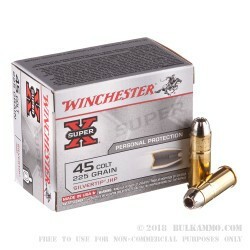 This is a cartridge best utilized in revolvers and is suitable for personal protection and hunting. DO NOT USE IN A TUBE-FED RIFLE! Q: Why is the ammo considered subsonic? A: Hello Joseph! 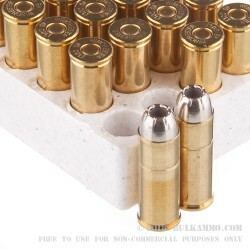 This ammunition is considered subsonic because the muzzle velocity is only 920 fps.